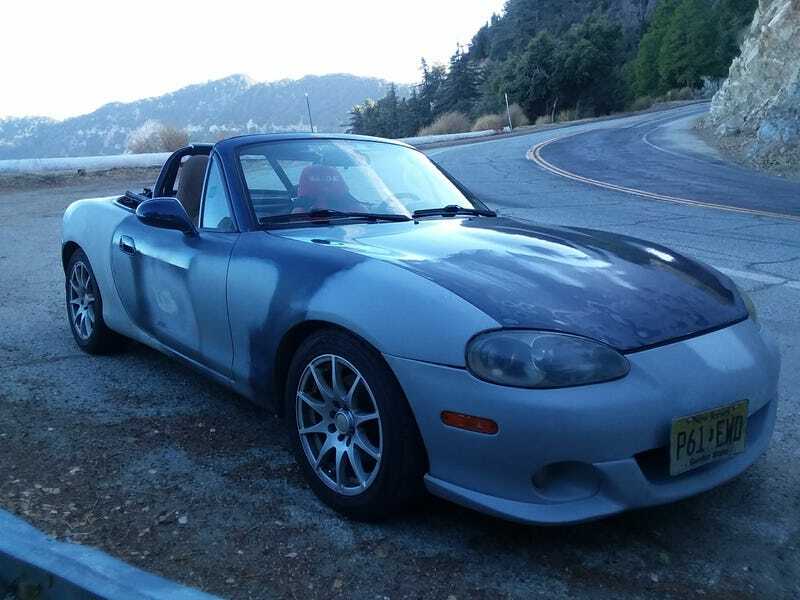 This past Sunday I finally went for my first cruise up to the Angeles Crest Highway in my Miata. Being in Woodland Hills, this is about 40 miles to get to the area but thankfully there wasnt much traffic that Sunday afternoon so I was there in just under an hour. I have driven up and down the ACH quite a few times in various rental cars and have always taken a chance to do a few runs up and down the Mt Wilson access road. Generally I have gone up there on weekday mornings to avoid traffic but now living here, I had to just come up on a Sunday. While of course I got stuck behind a few slow people here or there, it was still well worth it for the treat of beautiful scenery and great twisty roads. The Miata felt perfectly at home here, exhaust echoing off of the mountain wall next to me and feeding in the cool mountain air through the open top. It was nice to use my harness again although I just used it in my “hybrid” setup of just using the bottom four points and the stock seat belt for my upper body. I wasnt going nearly hard enough anyways to use the shoulder belts of the harness. Just and enjoyable Sunday drive! The foggy mountains made for an interesting sight, somewhere down there is the city of Los Angeles along with the Pacific ocean in the distance. The marine layer though was covering everything down there. Up at Mount Wilson was bright and sunny above the clouds. It was like being on top of the world. There were plenty of people out enjoying the roads up there and thankfully not too much police presence. I went up there via the Angeles Crest Highway, did about 3 runs up and down of the Mt Wilson access Road, and then returned via Big Tujunga. The latter part of the trip was a bit faster with high speed sweepers but it was also EMPTY so it was fun in its own way. I would have continued further on the ACH and up to the ski areas since it was open but I was running low on gas and didnt want to end up riding on empty for the last couple miles out of there. Overall a very fun day!